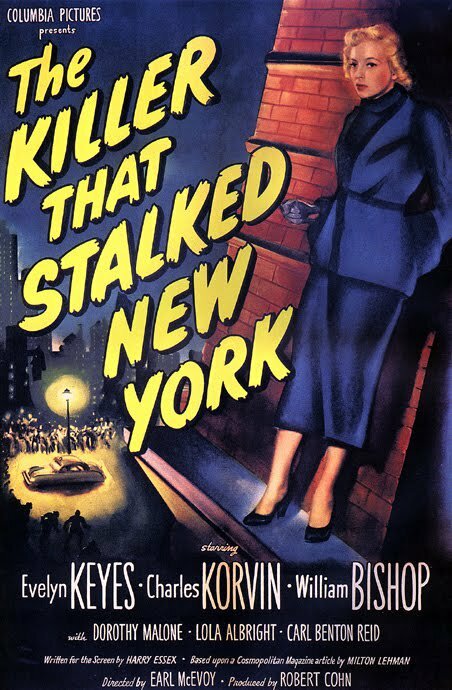 In the late 1940's and early 1950's, many films noir were made with a pseudo-documentary approach, whose realism was heightened with a dry voiceover narration, and shot on authentic urban locations. While this movie is not the best example of this style, it is an interesting mosaic. The deceptive title does not refer to a psycho killer, but rather tells the story of a woman on the lam from the police, who unknowingly is carrying the smallpox epidemic. This inferior B-movie cousin to Kazan's Panic In The Streets (released the same year) is ambitious in theory, if not scope. It is a very interesting concept to see Evelyn Keyes being trailed by both the police and the health organization (neither body is aware the other is also after her), and as such, this no-frills package instead spends time on exposition than characterization. Evelyn Keyes has had more impressive showcases in other noirs (see my reviews of 99 River Street and The Prowler), as she is given little to do but wander from one vignette to the next. 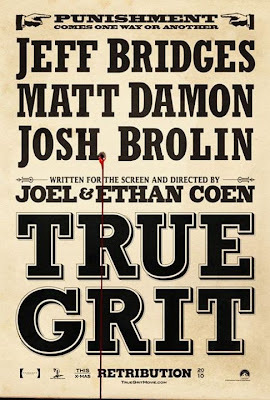 However, this little movie is engaging filler for a lazy Saturday afternoon. B movie addicts will likely react to many familiar faces that appear throughout this busy mosaic (Dorothy Malone, Lola Albright, Harry Shannon). Whit Bissell is most memorable, appearing as Keyes' estranged brother who briefly offers her shelter in his flophouse. Open on grainy footage inside a sweaty, crowded boxing arena. Cut to closeup of boxer Ernie Driscoll getting hit in the face- sweat sprays onto the camera. Cut to a shot of Driscoll watching himself box on the television set. The television narrator remarks that this was Payne's final fight. Cut to an extreme closeup of Ernie's eyes and sweaty forehead. His eyelids blink when the narrator explains that an eye injury ended his career. This decoupage, which opens 99 River Street, is compact storytelling at its best. We learn all we need to about our flawed hero in little screen time, and have had that communicated visually. Within these few moments we learn that our protagonist has had a fall from grace, and is prone to violence: classic traits of a film noir anti-hero. These first few moments also personify the economy of B-movies at their best: lean, no-nonsense prose with not a moment wasted- a perfect example of achieving much by working with so little. Driscoll (John Payne) now works at night driving a taxi, and on the surface he seems to enjoy his new environment: trading quips with his dispatcher (Frank Faylen- best remembered today as the sadistic orderly in The Lost Weekend and the cab driver in It's A Wonderful Life) and struggling actress Linda James (Evelyn Keyes) who likewise hangs out at the local diner. But as that opening sequence also suggests, all is not well below the surface, which is about to erupt. He just discovers that his wife Pauline (blonde bombshell Peggie Castle) is cheating on him with a two-bit mobster (Brad Dexter), who then kills her over complications with obtaining stolen jewels and plants her body in Ernie's taxi! For the rest of the film (which takes place entirely in one night), Payne, with the help of Keyes, tries to track down the hoods who were involved with her death, and evade the police in the process. From those opening shots, this movie simply does not let up, save for the rushed resolution. The story seems to change with every other scene, and no matter how outrageous this scenario escalates it is always kept believable, not that we are given much time to ponder such things. The cast reciprocates with game energy for the colourful roles they are given. Evelyn Keyes is given a great scene that most thespians would starve for, describing the sensation of being forced to kill someone out of defense-- all presented in one single take. While the camera remains on her throughout this scene, we "see" the act in our minds. This deceptively simple approach is a marvel of cinema. There is also a good supporting role for Jack Lambert (a familiar character player of the decade) as a mob flunkie who often crosses paths with Payne in this long night. 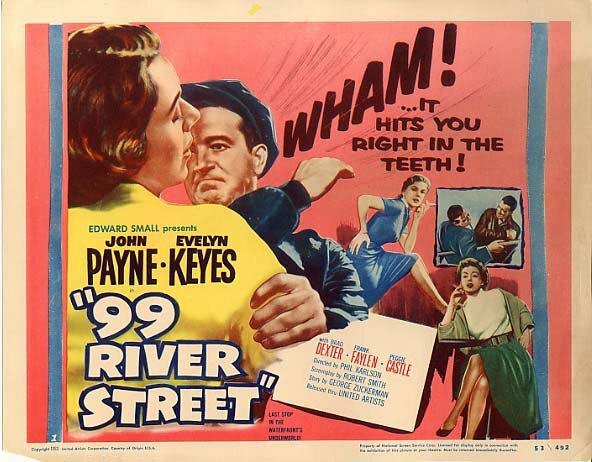 99 River Street may be the best of director Phil Karlson's noirs, made on a roll in the 1950's, and bears his distinctive docu-realism style (exemplary also in The Phenix City Story). This film is largely a symphony of close-ups and low angles, offering a lean, mean depiction of the world of violence and deceit into which Payne is thrown. 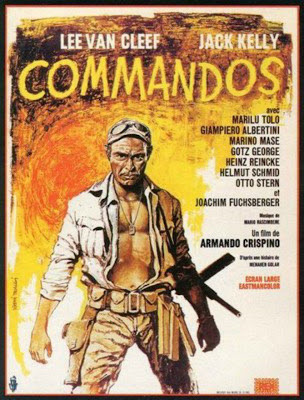 To date, I've seen Commandos three times- and I always have trouble remembering it the next day. Despite that it's a welcome change of pace for our hero, the movie is rather routine. But will I see it a fourth time? Hell, yes! For a quick timeline as to what subgenres were popular in European exploitation cinema at a given time during 1960 to 1990, one would do well to check the filmography of director Antonio Margheriti (whose name was often Anglicized on the credits as "Anthony M. Dawson"). Whenever such fare as spaghetti westerns, science fiction, Gothic horror, secret agents, mondo, peplum or gialli were fashionable, one could expect to see at least one such movie helmed by this workmanlike filmmaker. (Curiously, one of the few genres he missed out on was the boom of WW2-themed actioners of the late 1960's.) Unlike, say, Umberto Lenzi or Enzo Castellari, who also dabbled in many kinds of films during this period, Margheriti never truly specialized in a genre (however, his Gothic horror movies are generally considered to be his best). 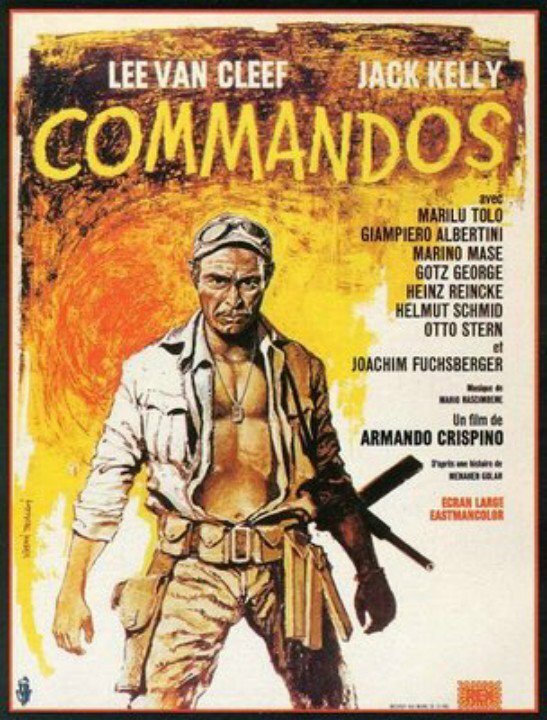 And to be certain, during the mid-1980s when producers on both sides of the Atlantic were making low-budget commando-type movies, following the success of Rambo or Missing In Action, Margheriti contributed several films to the fold. Code Name: Wildgeese is perhaps better remembered today, due to its bigger-than-usual cast of veterans who had second careers in European genre films. 25 years later, it still holds up rather well, less for its actors than for the fair bit of excitement onscreen. In this tale, Lewis Collins whips together a band of commandos to knock out an opium compound in southeast Asia. Lee Van Cleef appears as Travis, who is sprung from prison to pilot the helicopter. His old co-star from For a Few Dollars More, Klaus Kinski (with a British dubbed accent!) 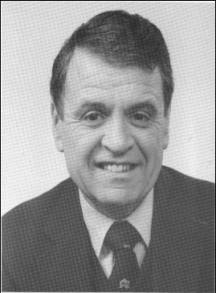 appears as Charlton, who spearheads the operation. Also in the interesting cast is strawberry-blonde American expatriate Mimsy Farmer as a drug slave(!) who gets rescued along the way. Familiar Euro-genre actor Alan Collins also appears as a priest (his crucifixion is one of the film's several bizarre stop points). But despite all of this star power, the acting is rather tired (or perhaps due to inspired dubbing). Only Ernest Borgnine seems to get into it. Still, this flick moves along at a good pace for its 105-minute running time, bringing in some good action setpieces. (We'll ignore the hilariously edited sequence where a car drives along the side of a tunnel.) Plus, what's an Italian genre picture without a double-cross or two? 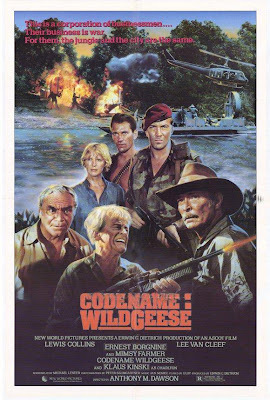 It's a workmanlike action movie that is rather exciting, and is also interesting in that characters spend as much time in business suits as army fatigues, reminding one that the bloodshed in the jungles is controlled by so-called civilized men. Music conjures images in our minds; songs are road maps to our private caches of memories. When we hear a cherished tune, we instantly recall the time we first heard it, or a time and place with which that piece is most synonymous with our individual experience. Thus, the opening sax riff on Gerry Rafferty's hit 70's song "Baker Street" will always conjure for me the beginning moments of the all-night show "The Cat's Pajamas", as that familiar instrumental intro was heard while a camera panned the blue night cityscape of Buffalo New York. Gerry Rafferty was formerly in Stealers Wheel, who made the AM radio chestnut "Stuck in the Middle With You", before doing his own well-received LP's, which gave us the hit singles "Right Down The Line" and of course, "Baker Street". Upon hearing of his passing this week at the age of 63, once again, the familiar strains of the latter song echoed in my mind, as did the comfortable images of those nights I often spent with Barry and the gang on "The Cat's Pajamas". God, I miss The Cat’s Pajamas. Film fanatics 30-plus years of age living in a city or town probably had access to at least one late show host. Back in the days when watching the tube after midnight didn’t mean sitting through incessant infomercials for exercise machines and salad spinners, instead you had some guy introducing the 12:30 AM broadcast of It Came From Pluto. And maybe in order to pay for the plumbing at the station, he unabashedly plugged a nearby pizzeria, whose staff hoped that their cheap advertising would reap revenue from orders by the stoned-out teenagers with the munchies who were watching because they had already seen the episode of "Tales from the Darkside" on Channel 12. Every metropolitan centre big or small had some local celebrity who flirted with the cathode ray tube- maybe you saw this guy at some hardware store’s grand opening at a shopping plaza. He wasn’t some packaged-up host like the syndicated pre-sold musings of Zacherly or Elvira- he was a real human being, someone who was talking to you that minute from across town or the nearby metropolis. He seemed to be in the same room that you were- the congenial face in the box was a rare stranger that you allowed in your home on regular intervals. You may never know this person in the flesh, but night after night it was comforting to know that they were on the opposite end of the transmission, sharing this moment with you. My late-night movie watching experience of this nature begins and ends with Barry Lillis, the host of "The Cat's Pajamas", which ran in the mid-to-late 1980s on WGRZ-TV, Buffalo's NBC affiliate. Well after Johnny Carson said good night, one would just be able to put a ham and cheese bun in the oven before sitting down to see a camera pan of the blue snowy city with the opening sax solo on "Baker Street", which was the call to form. Barry (also TV 2’s veteran weatherman) would appear as the affable host, introducing the old movies and TV shows. In between reels, he would also plug Mike’s Subs for the hungry insomniacs, and then another gentleman would pop up with a news brief about an accident down on Main Street. Then a still of slumbering cats perched in a crescent moon would appear as "Journey of the Sorceror" or Steely Dan’s version of "East St.Louis Toodle-oo" played. Then we were transported back to the show. Sometimes even the odd newsreel or serial chapter would pop up unannounced to fill some airtime before they began the morning daypart. With such a busy programming schedule, it was little wonder that a 73-minute TV-movie (remember when TV-movies used to be this long? used to be good?) would actually fill a two-hour timeslot. Of course, the impromptu scheduling was time-approximate anyway, but to ensure that all of their intended entertainment did unveil, the second feature would likely be shown without commercials. Friday and Saturday nights were the busiest of all- in between the standard plugs for Mike’s Subs, as well as giveaways (one time the love scene early in The Hustler was given a Brechtian notion when a subtitled appeared: "We have our winner- please hold your calls"!) and reading fan mail (yes!) sometimes the movies were secondary. One busy Friday night, the 74-minute It's a Gift took up two-and-a-half-hours! Nonetheless, they followed with Million Dollar Legs... uninterrupted (although sometimes the Cat’s Pajamas logo would appear if there was a delay in changing reels). This loose scheduling would drive prime-time programmers mad. Truthfully, this kind of practice on The Cat’s Pajamas was not at all upsetting. Usually, the movie you were watching was just another facet of the entire package. The point is, to all of those insomniacs, lonely people, babysitters, janitors and security guards, this show was a nightlight with a lot of warmth. These people were our friends! Then in 1987, the weeknight programming would consist of an old television show, followed by only one movie at 3 AM (broadcast without commercials, or at least the famous default: showing "Cat’s Pajamas" bumpers while reels changed). Soon even Randi would disappear from the Friday night line-up, and then the writing shouted from the wall. In the fall of 1989, Chamber of Horrors was shown on the Friday of Labour Day weekend, and it was all over. After that... infomercials! The same instance when I moved away to university, the Cat’s Pajamas became a soft-focus memory. Symbolic, maybe; poetic, perhaps; but certainly this affair ended with an irony for which most Hollywood screenplays starve. It’s another way in which life reminds us that nothing is permanent except for memories. Barry even stopped being the weatherman (in 1997) and went on to be a respectable voice in the community with his co-founded Kids Escaping Drugs campaigns (one had seen advertisements of this very thing in between his on-air plugs for submarines), and most significantly, becoming an ordained minister in Niagara Falls! The Cats Pajamas is probably something he would prefer to leave behind. It may sound like mush to be whining about a late-night show of yesteryear when -even though infomercials do persist on many stations- Showcase, Bravo and specialty stations still show movies in the wee hours. But it doesn’t take long to see how often they recycle their programming. The worst offender of this of course is the A&E 4 o’clock movie- just how many times does one need to see The Angel and The Badman (one of John Wayne’s lowlights)? Even so, all of this programming misses the point. Where is the spontaneity? Where is the voice from the other end of transmission? It at least felt like Barry and the gang were in my living room sharing memories over the nostalgia on the air. It didn’t matter that I wasn’t being shown Gone With The Wind. I would just as easily see an equally worthy gem as a diverting turkey. Yet I was witness to artifacts of other parts of cine-culture which are still vital to history, if we are not to believe the faceless specialty channel’s doctrine that cinema began in 1985,. But where are these titles now? It’s like the mournful melody of Don Henley’s song "The End of the Innocence" (which coincidentally was popular during the time of The Pajama’s final sigh), like the 30-year-old former dragstrip king driving his old car down Main Street seeing the empty buildings- catacombs of what used to be his youth. Did we outgrow those flickering images? Are they not important anymore? Today, surrogate companionship is more prevalent than ever, but now it's with laptops and Youtube. In an age of computer video games, downloading from the Internet, seeing Anthony Robbins with the same suit every night, and getting voicemail instead of a live person on the phone, it is no wonder we’re becoming just as impersonal as a machine. But at least I can remember a genuine feeling of community- knowing that I was sharing something with an actual human being on the other side of the screen. The film has ended. On screen, TV-2 emits a cartoonish-still of a sun rising behind tall buildings. They’ve put it to music by something from George Benson’s “Breezin’” LP. Turn your head. Through the crevice between the drapes the ashen sky is now magenta. Communion has ended. The 325-lined sunrise has transported you back to a physical one. Take your fuzzy slippers off the footstool. Throw the aluminum foil in the trash. Go to bed. Dream. Thanks, Barry. You were a true friend. January 1st is the first day of the new year, and for many, the first day of a new life-- when people resolve to make changes to their current situations. Yet for some, despite their ambitions to change, there is still an uncertainty as to where to go from here. 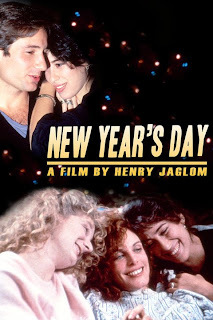 Such are the confusions of the four lead characters in writer-director Henry Jaglom's New Year's Day. Jaglom also stars as Drew, a late forty-ish writer who moves to New York on January 1, to begin a new life as he's tired of being miserable in LA. However, he discovers that the previous female tenants still have not moved out, as they believed their lease to state that they could stay there "through the first." The remainder of the film consists of Drew's observing and interacting with the three roommates, until everyone goes their separate ways after this one day. Since this is a Henry Jaglom film, the three women are all neurotic as hell. Winona (Melanie Winter) wants to have a three-month old baby next New Year's Day, however has no idea who the father will be; the clingy, unbalanced Annie (Gwen Welles) mostly cries about the girls' separation; and Lucy (Maggie Wheeler, billed here as Maggie Jakobson), seems to be the catalyst for the womens' departure, as she wants to escape New York for LA. New Year's Day is structured much like his previous two pictures which likewise probed the hang-ups of lonely, frustrated people (Always; Someone To Love). These pictures all work better when they're smaller- analyzing only a handful of people. All of these movies have a weak second act when the typical Jaglom stock company of philosophers and hangers-on show up to banter about life, love and everything. In this film, we see a revolving door of people who drop in on the ladies for their final day together, including Lucy's parents (separately), various middle-aged academics that naturally these wounded females swoon for, and especially Lucy's ex boyfriend (David Duchnovy in his film debut). The movie is largely seen through Drew's eyes (the film is bookended with Drew discussing this day to the camera), as he observes and interacts with the people who mysteriously blur in and out of the ladies' final day together. If anything, his slightly creepy character seems to blend well with this room of neurotics and social misfits. And since Drew is played by the writer-director, one needs not wonder why he gets to snuggle with Lucy. Hey, if Gene Wilder and Woody Allen can write themselves scenes with gorgeous women, why can't he? One admires Jaglom's ability to make the viewer like a fly on the wall- only gradually do we figure out people's connections with one another, just as one would in real life, as there is no expository dialogue which reveals these things early for the convenience of the viewer. And despite that this film takes place in one apartment (save for its opening shot in the lobby, and a few pans by the window looking into the snowy street), few films capture urban loneliness as well as this. Jaglom's work indeed has its virtues, although one must surely work to obtain. Nonetheless, New Year's Day is more approachable and entertaining than others of his oeuvre.